If you missed my original post on the Seth Rich case you can find it here, and for those of you who are not a avid readers, check out @TracyBeanz who put together an amazing video covering my post. Below are a few things I’ve come across in the past twenty-four to forty-eight hours regarding the case and, again, some of this could not have been done without the help of my awesome friends and followers on Twitter, so thank you everyone for your hard work and mad research skills! Saturday night I came across this picture of Seth which was used in a July 12, 2016 Heatst.com story and I can’t help but wonder who else was on scene that took the picture. Naturally it could have been anyone from the neighborhood who had been awakened by the gunshots and commotion but we don’t know that at this point. Interestingly, if you missed George Webb’s videos on Saturday, he went to the bar where Seth was last seen at and had a chat with both the bar’s owner and some of the staff. A few things to note: According to Joe Capone, the owner of the bar who was said to have offered to drive Seth home or get him a taxi on the night he was murdered, now claims he wasn’t even in town that night. He was in Ocean City, Maryland. The other thing that Webb noted was that Capone told him that Seth’s friends were “talking with him [Seth] in the ambulance while he was sitting up.” Webb concludes that that information may very well support his “handler theory” and the idea that Seth was drugged that night (if Webb was told the truth, that is). I’m not one to shy away from the theory that Seth was drugged and taken somewhere that night, only to be dropped off, already beaten, bruised, and shot, at the corner of Flagler and W. NW. There are stories already floating around out there that suggest Clinton’s goons picked him under the guise of being FBI agents or that Seth actually met with FBI agents. But getting back to Webb’s video, what if Seth’s friends really were at the scene of the shooting? Did one of them take the above picture or was it a neighbor? When did the friends get to the scene? Were they with Seth the entire evening and if so, why didn’t anyone see the shooter(s)? Why didn’t his girlfriend mention it—did she not know he was out with friends even though she allegedly spoke with him for almost two hours on the phone that night up until the moment he was shot? Did Seth call them after being shot? Did the police call them after Seth, who was very much alive and talking at the time, ask them to call his friends? So. Many. Questions. The other thing to consider here is what Webb was actually told (according to Webb)— “Seth’s friends were talking to him.” This might sound stupid mainly because I wasn’t there for the conversation but could the owner have meant Seth’s friends talked to him over the phone? No idea. More roommates? Have any of these people been interviewed? Before we jump to any conclusions we need to remember that the neighborhood, indeed, had seen a rise in crime in the preceding months and I’m about to prove it. So, there may not be anymore to this story other than the cops were doing a neighborhood patrol. But where were these guys on the night Seth was shot? And for obvious, conspiratorial reasons I can’t help but wonder if there’s more to this? Was there some sort of surveillance going on and if so what or who were they surveilling? The last tweet about the cops parked at that corner was on October 26, 2017, months after Seth’s murder. Again, my tinfoil hat is telling me they stuck around long after Seth’s murder to see who might be coming around to ask questions—and who was willing to answer them. Or, as you’ll read in the next section, “The Neighborhood Crime,” they were trying to make a manufactured scenario not look so obvious by pulling police out of the neighborhood right after Seth’s death. But I’m just a paranoid freak like that so maybe you shouldn’t buy into that theory too much. Okay, based on Roberts’ twitter account and his tweets, it seems pretty clear he lives in the neighborhood (again, did he take the picture of Seth in the street? Did he hear Seth talking?). The important thing here is that he wrote “no sirens” because that totally plays into the robbery narrative. Seth’s parents have repeatedly put forth the story that the shooter(s) were scared off because of how quickly the police arrived on scene but no sirens means “you no hear us coming.” However, the cops were said to be on motorcycles so maybe that did it…? Too bad the picture above only shows a squad car, two police officers, and no motorcycles. Just pointing that out. We have two conflicting stories about Seth’s neighborhood: it is an upscale and fairly area versus it was a violent hellhole where no one dared enter. So which is it? According to Scott Roberts’ blog (other websites confirm this), D.C. Chief Cathy Lanier stated that a. Seth’s neighborhood was generally pretty safe but that, admittedly, armed robberies had escalated in the four weeks leading up to Seth’s death and that b. She couldn’t confirm if Seth’s murder was related to these other crimes. That’s right. Apparently four weeks before Seth’s shooting a group of “silver handgun” bandits started roaming the 2-3 block radius around the area Seth got shot and the city was doing nothing to stop it. You may have noticed that more than one resident suggested that the Richs’ sue the city due to negligent which begs the question of “Why didn’t they sue?” It’s not like the family wasn’t aware of what was going on and I’m not saying that because Seth may have told his parents and/or brother about the rising violence in the area or about carrying water bottles around to protect himself. I say that because Seth’s brother, Aaron, actually posted on this very thread the day after his brother died. So it appears that the Rich family is fully aware of these alleged “silver handgun” maniacs plus what appears to be negligence on the part of city. So again, why in the world are these people threatening private investigators for discussing their son on television with regards to a completely plausible theory (Wikileaks source/DNC murder) but not threatening the city with a lawsuit? It’s insane if you ask me. Aaron’s post received multiple responses which you can check out yourself but I’ll leave you with this one where one neighbor stated that there was suppose to be security guards stationed around the construction sites in the neighborhood “24/7” but there had been reports that they weren’t showing up. Do you see how crazy this is? I don’t know if you guys are going to think I’m nuts by proposing this especially since I’m pretty reserved in the conspiracy department but here goes: The four weeks of crime leading up to Seth’s death was paid for by none other than George Soros. Yup. I said it. I’ve officially swan-dived off the conspiracy edge but here are my reasons why: Almost four weeks before Seth’s death is when Julian Assange hinted that he had an upcoming Clinton publication. Almost four weeks before Seth’s death is when the DNC said they had been hacked by Russians. Almost four weeks before Seth’s death is when Guccifer 2 came online. Almost four weeks before Seth’s death the shiz really starting hitting the fan. Think about this: Soros is a billionaire who has the ability to whip up political protests around the world, some of which have affected presidential election results. With that in mind, how hard would it really be for him to hire and pay the neighborhood security guards who never showed up to work and some small-time gangsters to terrorize a neighborhood for a month so that four weeks later an armed robbery gone bad looks completely plausible. I’ll help you: Not that hard. I’m totally sticking with this theory for now. 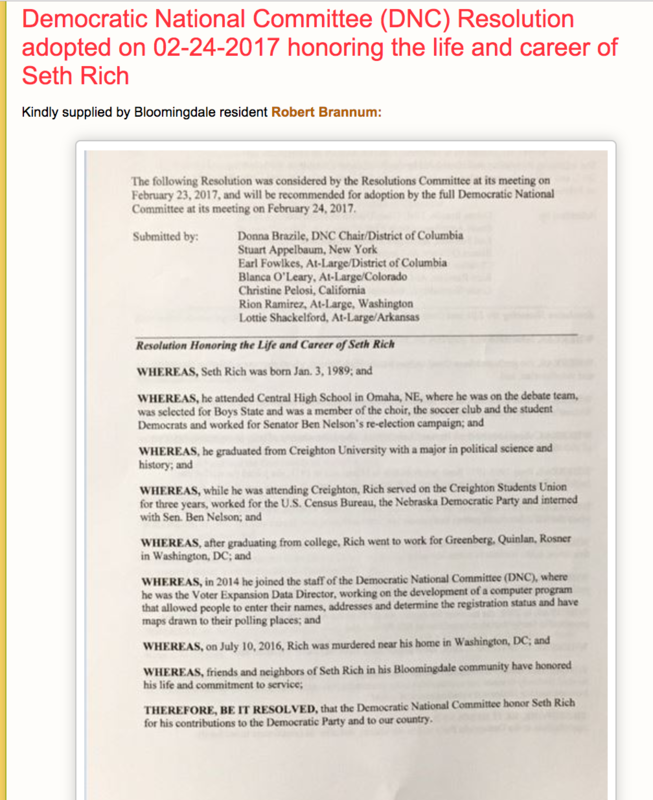 On Saturday I sent a DM out on Twitter that contained a screenshot from BeenVerified which showed the last verifiable address for Seth Rich was 430 S. Capitol St. SE, Washington, DC. Surprisingly (or not), this is the address for the DNC in Washington. Less than sixteen hours later, on May 21, 2017, Seth Rich’s records via BeenVerified were changed. The records no longer reflected the DNC as his last verifiable address and instead reflected the address that is seen on the police report from the night of his murder. Pretty effing weird, am I right? Also, take a look at some of George Webb’s videos. He talks about that 1222 Euclid St. address that shows up in the second BeenVerified report and believes that, contrary to the police report, that was where Seth was living at the time of his death. Another excellent point made on Twitter was that if someone did change Seth’s address to the DNC address, all of his mail would be delivered there. Oh, man. There is some dirty dealings happening here, folks. Someone’s been tinkering around with Seth’s Reddit account as well. Check out Caitlin Johnstone’s Medium article, “Someone Just Edited Seth Rich’s Reddit Posts” for a more detailed analysis. It’s got some good information in it. I haven’t had time to do any more digging on this firm—or to even dive into the polling scandal—but if you’re interested you might start with a list of people who work there which you can find HERE. Remember when I posted this yesterday from the Anon Med on 4 Chan? Eight hours. If Seth was shot at 4:30a.m. that takes us to 12:30p.m. on Sunday, July 10th. Yet, according to both Seth’s parents and every news source available, Seth was pronounced dead at 5:57a.m. on July 10th. So what gives? Like I said, I don’t put a lot of stock into these things and the only time he refers to the afternoon which technically he doesn’t even use that word, is the eight hour comment—that takes us to the afternoon on Sunday. Yet, everything else in the post refers to the morning hours. I find that odd. But is that enough to discredit the information? Not at all, but it’s also an anon post so how much credit can you give it in the first place? What we need is someone willing to leak some medical records. That’d clear this whole debacle up. I don’t know how many of you are following this lawsuit because even I’ve been relying on others to keep me up to date (there’s so much to keep track of these days!). @tracybeanz just put out a great video about this that you need to watch, especially if you haven’t been paying attention (or haven’t had the time). For a quick timeline about what happened here goes: Julian Assange indicated in June, 2016, he had an upcoming publication centering on Clinton. By the end of June, a group of Bernie supporters decided to sue the DNC for election fraud because as we all know now the Democratic primaries were rigged. On July 1, 2016, Sean Lucas, a process server, served the DNC at their headquarters in D.C. You can watch him serve it on Youtube. Nine days later Seth was murdered and on August 2, 2016, Sean Lucas was found dead in his bathroom. He was 38 years old. This guy comes up with some really unique, if not off-the-wall, theories all the time and I love him for it. I’m going to leave this without comment. Yup, he said he has the evidence (or rather, “is the evidence”) that Seth Rich was Wikileaks’ source and that he will present a statement about it on Tuesday, May 23, 2017. First of all, there’s almost nothing I’d rather see than every single politician, IC agent, and liberal get crushed underneath the brutal truth that Russia did not hack the DNC or John Podesta. Literally, almost nothing. But I’m not holding my breath on this one. And depending on what he shares (if anything), how he was involved in all of this (if he legitimately was suppose to be), and assuming none of this is about Wikileaks’ security, his “evidence” better not scare off whistleblowers, leakers, or hackers from Wikileaks or I’m going to be not.very.happy. For a list of Dotcom’s earlier tweets that strongly suggest he knew about the DNC and Podesta leaks prior to Wikileaks’ 2016 publications check out ZeroHedge.com. Jan 3, 1989 Seth Conrad Rich born to parents Joel and Mary Rich in Omaha, Nebraska. Seth was 27 at time of death. Approx. 2pm EDT Stephen Bannon of Brietbart News writes that Guccifer 2.0 has leaked an internal DNC memo that lists vulnerabilities Hillary faces due to activities of the Clinton Foundation. 7:10am Police report filed (CCN #16113797): “CIC reports the sound of gunshots at 2134 Flagler Pl. NW. Upon arriving to the scene, the decedent was laying in the Southwest corder of the intersection of W St. and Flagler Pl. NW. The decedent was conscious and breathing with apparent gunshot wound(s) to the back. The decedent was transported to local area hospital and was pronounced by attending physician at 0557 hours.” Responding office listed as: “Jody O’Leary (#7859)”. Assisting officers listed as: “ROBERT WINGATE ROBINSON (#7634)(Body Worn Camera),Derek Tarr (#9237)(Other Officers At Scene),Shea Ellis (#9499)(Other Officers At Scene),Benjamin Velez (#6631)(Body Worn Camera),Mark Lee (#6141)(Body Worn Camera)”. Please leave a comment below or tweet me with your feedback, crazy theories, or spelling and grammar errors (probably best to ignore the spelling/grammar errors, no one has time to correct the level of incompetency seen in this post) to @jimmysllama. Wow! Where to begin? I guess I’ll just say that Burkman (Republican lobbyist on the “Russia did it” thing) seems to be up to his neck in whatever is going on. Seems really odd to me that the parents would choose to do a press conference offering a reward with a Republican seeing as how Seth was such an avid and enthusiastic DNC guy. And I thought “the Russians did it” was mostly a favorite of Democrats at that time — although I could be wrong. This seems to be something that’s said whenever a politician type wants to “muddy the waters” on the subject at hand. There’s obviously something big going on here that nobody seems to want the public to know about. When it comes to cases like this in these times, I take nothing at face value. I believe nothing I hear and only half of what I see. P.S., The silver handgun bandits thing seems like another invented detail or some sort of elaborate distraction, so I wouldn’t be a bit surprised to find that Soros or someone else provided it. The 4th year resident states there were three gunshot wounds. Two were entry and one was an exit wound. So if the bullet was still inside Seth, who has it now? Where was it found? Did the cops find the one that exited? What do the forensics show about the gun(s) used? Apparently there “were no shell casings”…. There’s so much conflicting information…. If the “robbers” were “too much in a hurry” to even steal his wallet, phone, or watch, how could the casings be missing? I thought “they quickly ran off when the cops were on their way” (with no sirens on, apparently. Jesus…. Rest In Peace, Seth. We'll find out who did it. Simple. That would indicate a revolver was used. The shell casings stay inside the wheel until they are cleared, manually and then it’s reloaded. Bu the bullet that remained would tell a lot… where’s that bullet? The other one that passed through should have been found as well, I would think, but it’s sure that the one that did not exit would still give a lot of information. Yes, Seth’s mom stated it was a revolver, I believe, at the November 21, 2016 press conference. 3 wounds, 2 entry & 1 exit is nonsense. If a bullet went thru a person from his back to this front & out, that would be 1 wound. A theory that the Russians shot Seth Rich is absurd. Nope. Three wounds. The entry wound is usually quite small but the exit wound can be quite large, depending on the type of bullet and the gun used. For instance, I have a .357. If I shoot using a .357 hollow point, the entry wound would be smaller, but the exit wound would be huge. It makes perfect sense, if you know anything at all about guns, to describe the three wounds just as that anonymous resident doctor described. I’ve been a Life-Flight paramedic for almost 20 years. Technically that’s 2 wounds… a through and through, with an entry and exit, and a 2nd GSW (gun shot wound) with just an entry (where the bullet dumped all it’s energy in the target). At least that’s how I’d describe it on the radio, in the trauma room, and in my paperwork. A bullet typically enters with a small, puncture-looking entrance wound, then causes a temporary, large cavity, as it passes through and stretches tissue, leaves a smaller permanent cavity, or track in it’s “wake”, then exits, typically with much larger, ragged, ugly looking wound. To me, that’s a single GSW. But, I could see a doc, especially a surgeon, describing it as 2 separate wounds — they worry about the entrance, the track / cavity and what structures / organs are involved, then obviously the larger (in most cases) exit wound. All that said, bullets do unexpected things sometimes, and don’t always follow a straight path, or they fragment and cause more than one cavity, or exit wound. As stated above, where the hell are the bullets? I’m guessing in the same place as his laptop. Thanks, Brett. That makes sense as well. I would think most of us not being in the medical profession at all, would envision and think of each wound as separate. I know hunters look for both… a clean shot would hit the target animal in the heart/lung area and pass through unobstructed, and the animal dies with little internal damage. Sometimes the bullet doesn’t pass through, but might be found just under the skin as the animal is skinned out. And, bullets, if they hit bone, can traverse the entire length of the body, entering at one point and maybe exiting up under the ear or in the neck, If they hit bone such as ribs or whatever, they can ricochet around and do tremendous damage internally. And bullets, depending on what kind and what they are made of, can fragment, but if they remain whole, they will mushroom/expand once they hit their target. Again, how much depends on the type of bullet. Bullets have “fingerprints”. They can be traced back to the registered owner. My .357 was a police issued revolver. I don’t have the specifics on it. I do, however, have the specifics on a new .22 revolver I bought. Every gun is fired once before sold. The info I have on the envelope, which contains the casing from that, states the make, caliber, and gun type. It also states the rifling characteristics as such: 1 in 14″ right hand twist, 5 lands and groves, land width = .0xx” This is kept on file, along with the collector’s name and the date collected, the model # and the serial #. So if my guns are stolen or loaned to someone who commits a crime, the bullets can be used to trace the gun back to me. So… what info does that bullet say about the shooter in Seth’s case? So… if the cops found the other bullet that did pass through, they would compare the two and find out if both were fired from the same gun or if from two different guns. But they should be able to trace the bullets back to the registered owner based on the rifling characteristics. I am just kind of guessing though. I am not a forensics expert. So, I’ve been following the case lightly. Nice set of detailed facts pulled together by jimmysllama. Read the following and keep in mind that my childhood was filled with “interesting” people and may bias the questions. 1) Is Seth Rich really dead? 2) How was his body ID’d? Visually by relative or by a photo? Easily faked with the latter. 3) Maybe he is in FBI witness protection program after his attempted murder? net with a high degree of accuracy, i.e. /pol/. to unfurl and even more years to get to trial. In short, there will be no expedient resolution. Again, great job on the research. I ran a pic test of the Setth Crime scene from Heat Street. Being they were the first to put it up on july 12 it came up as altered pix..with origins to popular software editing progs. Other than for cropping to fit there should be no reason to alter the contents..which show quite a few discrepancies too numerous.to discuss. The Izitru website will run a test only with an original picture before certifying it is kosher..at no charge..and placing in its compendium of certified pix.. I twitterd Heatst but got no response.. It should be obvious to most by now..that information such as addresses can be seeded into most databanks..even on wayback..because they are used to create what the intel community calls cutouts..info is just a digit just like a pixel..and easily manipulated..like a headline can. That said..It was a mystery to me why no attribution, copyright etc on the photo..
Maybe you all can ask Heatstreet how they got it..to run it thru.and post the results.it won’t be the first time a paper got an edited photo..remember..images have been responsible for us going to war..and inciting to such..so it’s important.